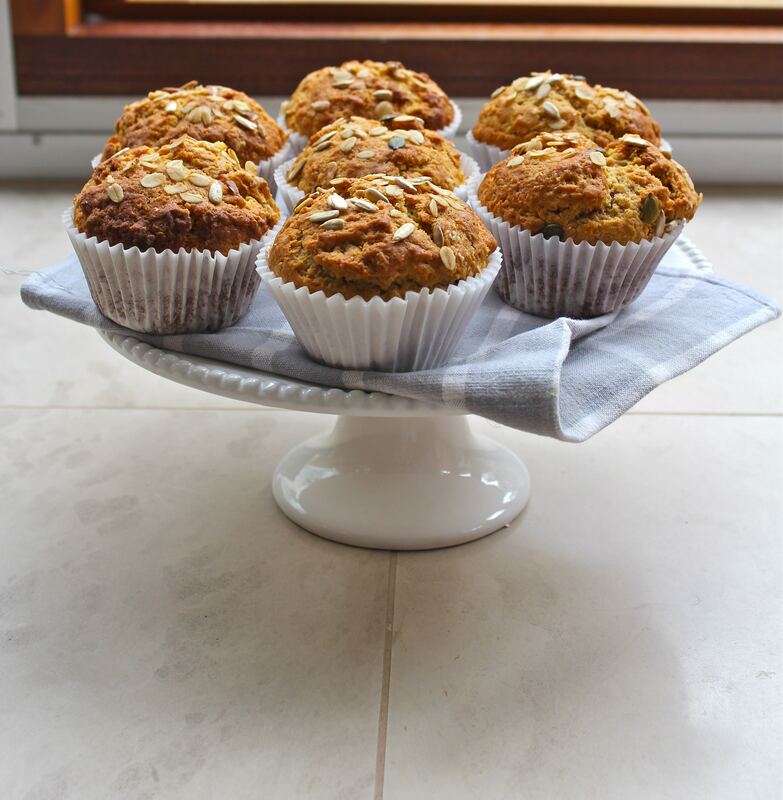 This entry was posted in Breakfast, Fruit/Vegetable Cakes, Muffins, Simple Cakes and tagged Breakfast, Cinnamon, Cupcake, Dessert, ginger, Healthy, light, Muffin, olive oil, Rhubarb, sugar free, wholemeal. Bookmark the permalink. You definitely should make some rhubarb! I love it as well because it’s so tangy and goes so well with sweet things. I can never think of new ways to use it though! These look absolutely delicious. Where did you get rhubarb at this time of the year? Have a wonderful week! Hahaha! This made me smile — what a hilarious story. I recently found a scrapbook I tried to make back in high school where I’d written in curly script “Graduaduation” across the first page and then scribbled it out and evidently gave up in embarrassment and rage. I’m sure your cake was delicious and beautiful even if it did miss one teensy letter 🙂 They got the message, right?! haha. And these muffins are equally gorgeous! When I’m asked to make a celebration cake for someone, I’m so paranoid about getting the lettering wrong, I practice it on baking paper until my arms ache. Then I still have to get my someone to check it for me to make sure I got it right. But these muffins are perfect, not a spelling error in sight. The cake sounds delicious and I’m sure your friend appreciated the effort put into making it more than the spelling 🙂 These muffins look wonderful and so tasty 🙂 I love the pretty color of the rhubarb filling too! 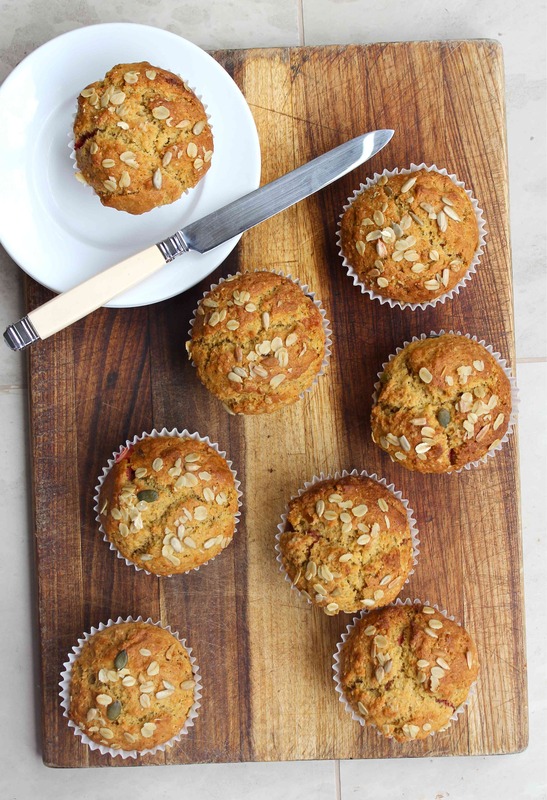 These muffins look so inviting and great for the breakfast on the go! Oh lovely. First time at your blog and I’m already drooling. 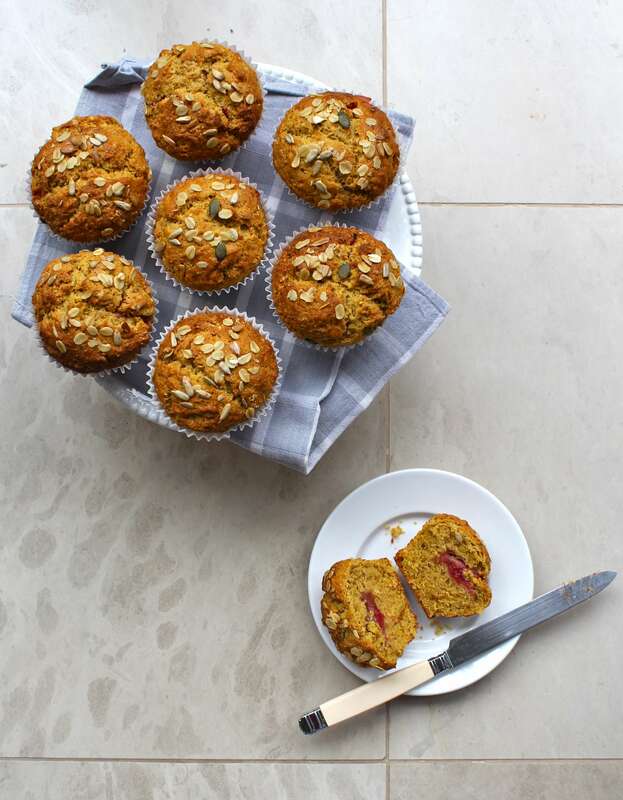 Gorgeous pictures, my friend 😉 I have never added rhubarb to muffins before but now it’s a must! Thank you! 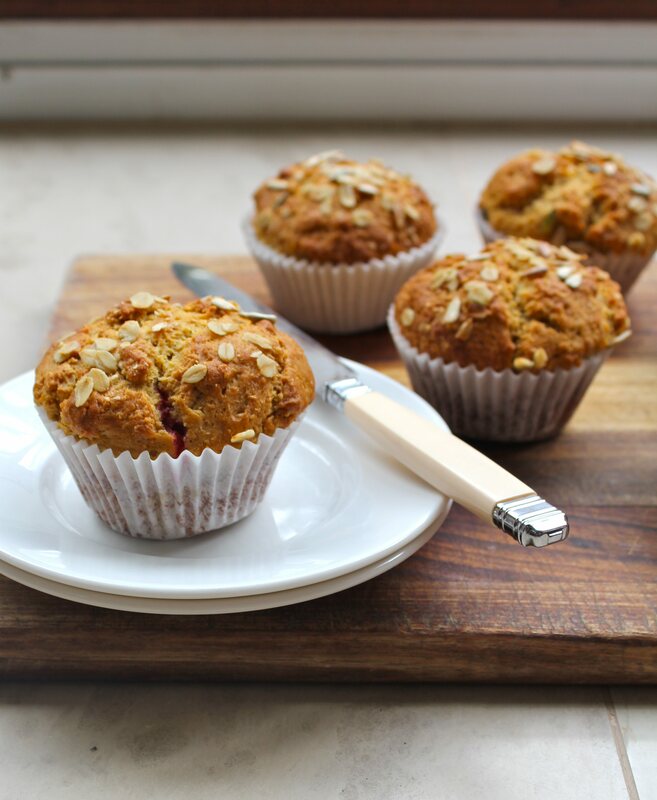 Rhubarb works great in muffins because it’s so tangy 🙂 hope you like them! These muffins look perfect! I can’t believe it’s been so long since I made muffins..that has got to change!! Whenever I make muffins I wonder how it’s been so long since I made them last!! 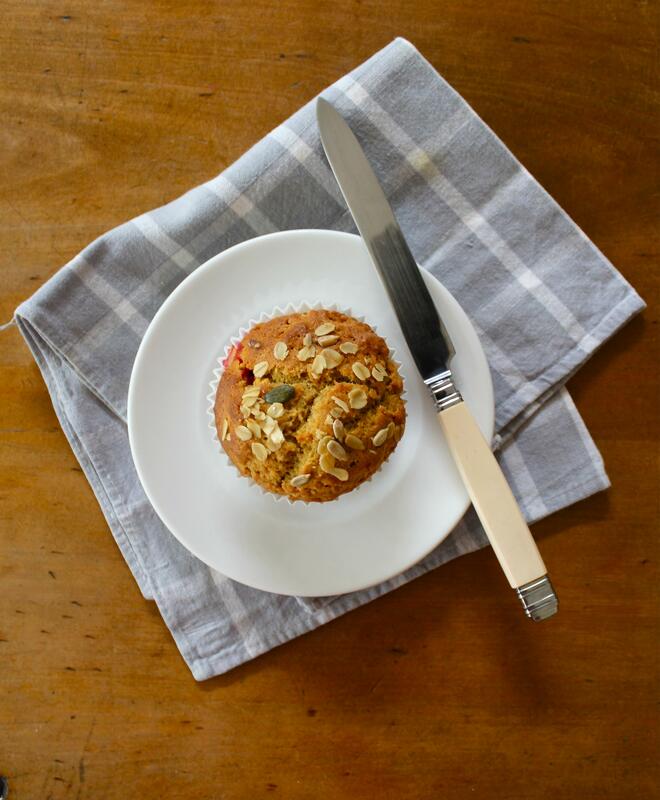 I love healthy muffins, they’re the perfect breakfast! 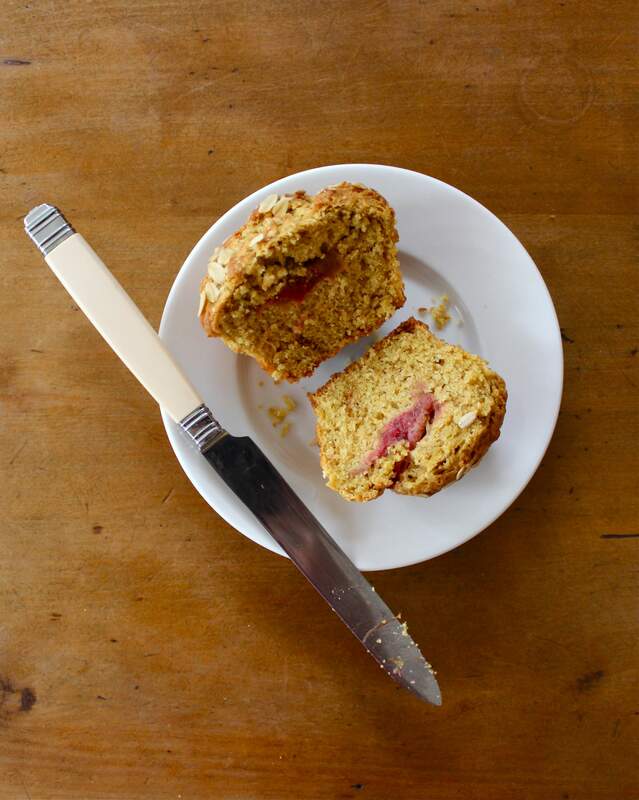 I cannot wait to get my hands on some rhubard so I can make these and enjoy them with my morning cuppa! I want to make a cake out of this recipe instead of muffins. How long should I bake it for instead?